If I asked you to name a English cheese I'd bet you'd name either Stilton or Cheddar. If you stretched you might come up with Huntsman or maybe white Stilton with cranberries. British cheese is more than those, just as it's more than Sherlock Holmes and royals. It's Lancashire, it's Cheshire, it’s Gloucester it's Leicester, and its Stichelton. They’re named after towns and counties (or territories) in the ruminant minded countryside. They call them Territorials and although their names might be relatively well known due to large scale produced versions, most of them are only made with traditional recipes and production methods by one producer or family. One producer stands between the extinction of the traditional method and total commercialization of these cheeses. Like in the states if you wandered through a large market in England you’ll find flavorless blocks and wedges of cheese, bearing the names of Territorials but they’re as close to them as I am to being a astronaut. A couple of things brought English cheese to where it is today; the mechanization of cheese production (originates in New York, for you guessed it, cheddar) and two world wars. When Jesse Williams figured out how to make cheddar more efficiently in 1851, taking it from a twelve plus hour chore to a four to six hour job. The cheese that was made then would be instantly recognizable to today’s grocery shopper, sharp cheddar with a consistent flavor regardless of what time of year it was made, in neat blocks lined up like soldiers marching on parade. We got so good at making this commodity cheese that we actually exported thousands of tons overseas, and seeing an easier way to make a buck with less back breaking soon England was churning out commodity cheddar and commodity versions of their Territorials. During both world wars the dairy industry in England was dealt a crappy hand; cheesemakers were strongly encouraged to support the war effort by making commodity cheese, and had to well into the sixties due to rationing and lingering redundant government control. Also, most of the boys volunteered or were drafted and sent off to fight for king and country and those that made it out alive didn’t always go back to the farm and cheese vat. So farmhouse cheese became and is a rare thing in England (and elsewhere) as it was both cheaper and faster to make commodity cheese. (A very un-British-like disregard for tradition and history if you ask us) But there is hope, in the late 80’s and early 90’s British dairy started to shake off the chains of commercialization and mass production; enter some hardworking women and Neal’s Yard Dairy. Neal’s Yard Dairy was founded in the 80’s by Randolph Hodgson in the Covent Garden/Seven Dials area of London, initially selling yogurt and fresh cheeses and then British farmhouse cheeses; eventually it grew into a second shop in Borough Market and an aging facility in Bermondsey. Randolph, and Neal’s Yard Dairy, became the champion of British farmhouse cheese, especially of raw milk cheese; by buying these cheeses, working with the cheesemakers to make better cheeses or even new cheeses, and visiting the cheesemakers on their farms to taste and select cheeses for the shops every couple of weeks. The other revolutionary thing they did was they got cheesemakers talking and visiting each other, Randolph would take cheesemakers with him to other farms on buying/tasting trips, so they could taste and talk and learn and grow. We work with Neal’s Yard Dairy in London to bring British cheese to our counter. Every Monday the export team will walk through the aging rooms with the head of maturation Owen and taste the batches that he thinks are ready to leave his care. Owen, and his team, receives the cheese when it arrives at NYD and tastes it on a regular basis as they mature, they’re also the ones that flip and pat, rub and wipe every wheel on a set schedule to ensure optimum flavor and quality. Every week we chat with a member of the export team (hi Rick!) after they do their weekly walk through and tasting; I’ll answer the call with either a vague idea or a specific cheese in mind and then based on their weekly tasting we’ll pick out one or two cheeses. That’s a very large part of how they sell cheese, they sell it on seasonality and flavor profile, not just on age or market demand and spreadsheets. They also recommend and pick wheels based on “my” flavor profile, I listen and watch how our customers like the cheeses and over the years we’ve learned there are certain flavor profiles our customers like and some they don’t. They also act as educators, they taught me everything I know about British cheese, and a very large chunk of how to take care of and sell cheese. If you want to try what the real territorials tastes like you might be in a bind in the United States, unless you happen to know a cheese shop that has a monger that loves British cheese. Hmmm, I wonder where one of those would be? So, about those territorials? Well right now we’ve got a handful, and it changes on a regular basis, so read on. Appleby’s Cheshire is a cheese we’ve talked about before but we’re more than happy to talk about all day long; Cheshire has been around since 1086 when it was mentioned in the Domesday Book and the Appleby’s are the last ones making it with raw milk and cloth binding it. Its crumbly and short, it tastes like the limestone plateau that the cows graze on, its tastes of grass with an acidic bite. Appleby’s Double Gloucester is the other cheese that the Appleby’s make, using the same milk and the same equipment but with a different recipe, the same recipe that matriarch Lucy Appleby learned in school. Made with different temperature, timing, and acidity Double Gloucester is less crumbly with a richer mouth feel, it tastes of toast and onions with a pop of acidity. Sparkenhoe Red Leicester is made by David and Jo Clarke and they didn’t actually intend to make Red Leicester when they started making cheese but a neighbor in the pub caught their interest while reminiscing about pre-1957 Leicester that used to be made on a neighboring farm. Why 1957? Well that's the year that the last farmhouse producer of Red Leicester retired and stopped making cheese. Red Leicester is a relatively new cheese, it was created when Stilton makers had surplus milk after meeting their Stilton making quotas. Recipe wise, some cheese historians say that its between a Cheddar and a Cheshire, which would make sense as geographically Leicestershire is about halfway between them. Red Leicester tends to be a much more subtle cheese than British cheddars are, but lack the minerally and crumble texture of a Cheshire; savory notes of veggie broth and root veggies, summer grasses, battered fried jalapenos, and a hint of an acidic bite on the end. Fun fact, the Sparkenhoe Red Leicester was the cheese that made us fall in love with British territorials and start working with Neal’s Yard directly. Mrs Kirkham’s Lancashire is another cheese that was almost lost but was “saved” by a woman and is now only made by one family farm using raw milk and cloth binding it. Made by Mrs Kirkham’s grandson Graham now (he left the farm just after school and was a racecar driver for a while but after his dad got sick he went back and took over full time) and under his leadership they built a new state of the art dairy. Lancashire, in Graham’s words, is a floofy monster and his ideal cheese is also has a texture of buttery crumble; it is made by blending together two day’s worth of curds to give it more depth of flavor, but in texture its is both fluffy with a springy texture but dense with a higher moisture content. Tangy, but not like cheddar, more like european yogurt or sour cream with distinct cultured butter richness. Pair it with plums or peaches, it also likes pickles and garlicy salame. Colston Bassett Stilton (NYD recipe) is made by one of six licensed Stilton producers and is one of the smallest producers, using milk from 5 neighboring family owned farms. Colston Bassett uses a slightly different recipe when making Stilton for Neal’s Yard Dairy, they use traditional animal rennet to coagulate the milk (which gives more depth of flavor that using non-animal rennet) and they pierce the cheese at a later date and less times (which allows the cheese to develop flavor before it “blues”) and allow it to age slightly longer. The result is a milder and butteryer cheese that is less aggressive in the bluing that has a creamy moist texture that you can both spread and crumble. Stichelton is a unique cheeses, it’s a throwback to pre-1996 Stilton made by American-born Joe Schneider on the Collingsthwaite Farm in Nottinghamshire. Why 1996 you ask, well in ‘96 Stilton was granted PDO (protected status) and at the same time the British Isles were having a un-related-to-cheese food scare and the newly formed Stilton Makers Association decreed that from then on all Stilton must be pasteurized. 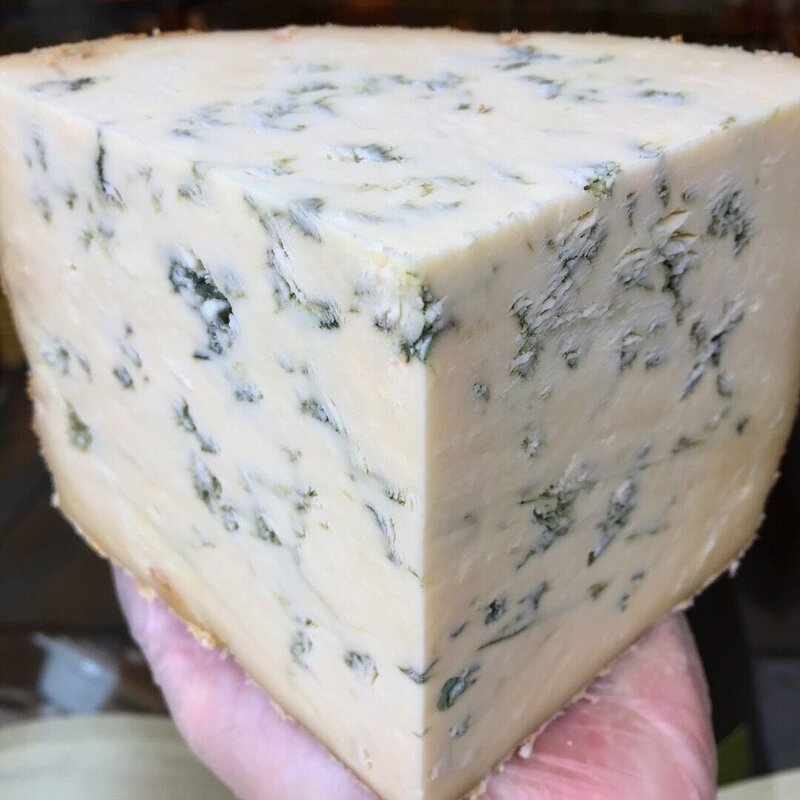 Then in 2006 Randolph Hodgson partnered with Joe to try and recreate the more nuanced and savory Stilton of yester-year but they couldn’t call it Stilton (because its raw milk the Stilton makers Association wouldn't let them) so they named it Stichelton, which is a Middle English name for Stilton. Stichelton is a “low and slow” cheese, it takes at least 24 hours to make every batch, with a long culture/ferment time to allow the milk to develop more depth and nuance; Stichelton is also (like the NYD recipe Stilton) pierced a lot later than what would be considered normal to allow the cheese to develop its own flavor before the blue mold is encouraged to grow. Stichelton doesn’t have the in your face flavor punch that you get from Stilton; it reminds me of fresh whole milk, spiced nuts, spiced curry, occasionally of pears and cocoa.